What Is Manure Worth Compared to Commercial Fertilizer? Animal manure is considered an agricultural commodity that can be utilized as a fertilizer source for pastureland, cropland and hay production. Manure is recognized as an excellent source of the plant nutrients nitrogen (N), phosphorus (P) and potassium (K). In addition, manure returns organic matter and other nutrients such as calcium, magnesium and sulfur to the soil, building soil fertility and quality. Any financial valuation of manure would be dependent on the market value of the N, P, K, and other plant nutrients that the manure is replacing, organic matter as a soil amendment, and the nutrient needs of the crops and fields receiving the litter. The nutrient content of manure will vary depending on animal type and diet, type and amount of bedding, manure moisture content, and storage method. For more information, see the Clemson University publication Livestock Manure Production Rates and Nutrient Content. 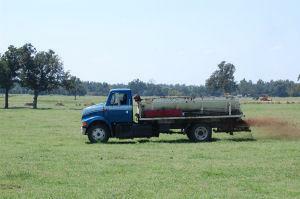 Buyers and sellers should have a lab analysis to determine moisture and nutrient concentration of the manure. Generally speaking, liquid manures will contain a lower nutrient content than solid manures, due to the dilution effect. Assuming all nutrients are needed by the crop, higher manure nutrient content corresponds to higher manure value. Higher values help to offset transportation and handling costs. Phosphorus and Potassium in manure are mostly present in the inorganic form. This means that P and K are similar to commercial fertilizer in that they are readily available for plant uptake. Most nutrient management plans are based on a P-Index or P-threshold which may limit manure application on some fields. Therefore, the value of these nutrients is based on crop nutrient needs as determined by a soil test and yield goal. Other nutrients such as calcium (Ca), magnesium (Mg) and sulfur (S) may be found in manure and are beneficial to the soil if a deficiency exists. Both Ca and Mg create an added value by producing a liming effect when added to the soil. Organic matter, primarily undigested feed and bacteria in the feces, increases infiltration of water, increases water holding capacity, enhances retention of nutrients, reduces wind and water erosion and promotes the growth of beneficial organisms when added to the soil. Although the value of organic matter is hard to quantify, higher quality soils are associated with increased yields and higher economic returns. Because manure is not a balanced fertilizer, some plant nutrient needs may be met while other nutrients may be under- or over-supplied. Any nutrient that is undersupplied by a manure application could incur a subsequent fertilizer application cost which would, in effect, lower the net value of the manure. Any nutrient that is oversupplied by a manure application would not have immediate value because it was not needed by the crop.